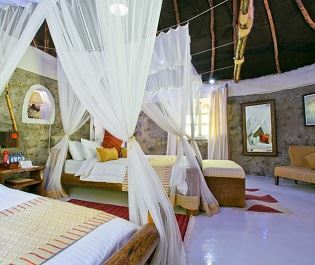 Panoramas of green and sapphire greet you at this luxurious tented camp in the heart of Kenya. Located in its own wildlife conservancy, the camp is perfectly positioned along the shores of Lake Elmenteita, where birds like flamingos and pelicans congregate in phenomenal numbers. This is a place of sanctuary, where endangered Rothschild giraffe roam past the tents and the views always hold you captive. 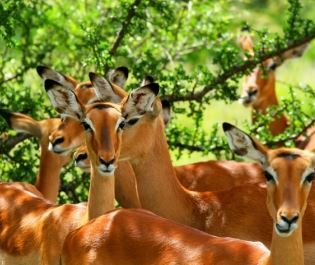 The conservancy protects over 15,000 animals and we love how easy the safaris are. Cute little dik dik, nimble klipspringer, giant elands, zebras...you can see it all on short game drives and exclusive walking safaris. You’ll also see many of the animals silhouetted during atmospheric bush dinners. It takes around 30 minutes to drive from the lodge to Lake Nakuru National Park, where we’d recommend spending the full day. It’s a famous place for spotting rhinos and one of Kenya’s premium parks. Upon returning, wash off the dust then bathe in the swimming pool and perhaps add on a massage. Each of the 24 tents has a private wooden verandah with uninterrupted views over the lake. Unusually, the tents have canvas roofs and stone walls. Wooden flooring, opulent bathrooms, and four-posted beds complete the tents; we think the style is closer to a luxury lodge than a tented camp.